Pope Pius VIII (20 November 1761 – 30 November 1830), born Francesco Saverio Castiglioni,[lower-alpha 1] reigned as Pope from 31 March 1829 to his death in 1830. Pius VIII's pontificate was the shortest of all the popes of the 19th century, and is likely the least remembered. His brief papacy witnessed the Catholic Emancipation in Great Britain in 1829, which he welcomed, and the July Revolution in France in 1830, which he reluctantly accepted. Pius VIII is often remembered for his writings on marriages between Catholics and Protestants in the 1830 encyclical Litteris altero abhinc, in which he declared that a marriage could only be properly blessed if proper provisions had been made to ensure the bringing up of children in the Catholic faith. His death less than two years after his election to the papacy has led to speculation of a possible murder. Francesco Saverio Castiglioni was born in Cingoli, Marche, the third of eight children of Count Ottavio Castiglioni and his wife Sanzia Ghislieri. His baptismal name was recorded as Francesco Saverio Maria Felice. He studied at the Collegio Campana run by the Society of Jesus and, after that, at the University of Bologna where he earned a doctorate in canon law and in civil law in 1785. He was ordained to the priesthood on December 17, 1785. He served as the Vicar General of Anagni (1788–90), Fano (1790-97) and Ascoli Piceno (1797-1800). In 1800, Castiglioni was appointed as the Bishop of Montalto. Castiglione received episcopal consecration in 1800 in Rome and commenced his work in his new diocese. After he refused to swear allegiance to Napoleon I of France (1804–14, 1815) he was taken to a series of Italian cities before being sent to France. After Napoleon fell, he returned to his diocese in 1814. He was praised by Pope Pius VII who in 1816 elevated him to the cardinalate as the Cardinal-Priest of Santa Maria in Traspontina. He held various high offices thereafter, including that of Major Penitentiary. He soon became a Cardinal-Bishop of the suburbicarian see of Frascati. "As a Cardinal, Castiglione had continued to live modestly, made no enemies, and although his own private life had always been irreproachable, he had shown no signs of censoriousness where others were concerned. He suffered from a very painful and distressing complaint, having perpetually suppurating sores on his neck and body, and [later as pope] was far too ill and feeble to do more than sign the documents presented to him by [Cardinal] Albani, who ruled the Papal States as autocratically as though he had himself worn the triple crown." After the death of Pope Leo XII in 1829, Castiglioni was again considered to be a major candidate, though was questioned due to his frail health. Despite these concerns, he was elected as pope in the papal conclave of 1829. Given that Pope Pius VII had referred to him as Pius VIII, it seemed only suitable that it was the pontifical name that he chose. His coronation took place on April 5, 1829. "We must also be wary of those who publish the Bible with new interpretations contrary to the Church's laws. They skillfully distort the meaning by their own interpretation. They print the Bibles in the vernacular and, absorbing an incredible expense, offer them free even to the uneducated. Furthermore, the Bibles are rarely without perverse little inserts to ensure that the reader imbibes their lethal poison instead of the saving water of salvation." On 25 March 1830, in the brief encyclical Litteris altero, he condemned the masonic secret societies and modernist biblical translations. An 1829 painting by Horace Vernet of Pope Pius VIII in the Sedia gestatoria. His brief pontificate saw the Catholic Emancipation in the United Kingdom and the July Revolution in France, which occurred in 1829 and 1830, respectively. Pius VIII recognised Louis Philippe (1830–48) as French king and allowed him to use the French king's customary title "Roi Très Chretien," which means "His Most Christian Majesty." Pius VIII accepted the situation on mixed marriages between Protestants and Catholics in Germany, but he opposed changes in Ireland and Poland, which were still strongly Catholic. In Litteris altero abhinc, he declared that a mixed marriage could only be blessed by a priest if proper promises had been made to educate the children of the marriage as Catholics. Pius VIII also held three consistories in which he elevated a total of six men into the cardinalate. He held these ceremonies on July 27, 1829, March 15, 1830, and July 5, 1830. He canonized no saints during his brief pontificate but he beatified two individuals. In 1830 he proclaimed Saint Bernard of Clairvaux a Doctor of the Church. 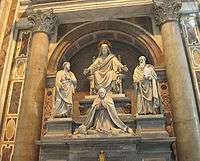 The monument to Pius VIII. "During the dissection of the Pope's body, which occurred yesterday evening, as far as they say, only very healthy internal organs (viscera) were found, except some weakness of the lungs, or, according to others, a tired heart; it is therefore impossible to know the cause of death." These few words have been interpreted by some conspiracy theory proponents as evidence that the late pontiff had indeed been poisoned. Cardinal Camillo di Pietro gave the funeral ovation for the late pope, before the cardinals entered the conclave to choose a successor. The late pope was succeeded by Pope Gregory XVI. ↑ "CASTIGLIONI, Francesco Saverio (1761-1830)". The Cardinals of the Holy Roman Church. Retrieved 11 February 2014. ↑ Pirie, Valérie. LEO XII (DELLA GENGA) Pickle Pushing. Web. Retrieved 28 February 2016. ↑ "Pope Pius VIII: Proceedings of the Conclave that led to his election". Pickle-publishing.com. Retrieved 23 June 2013. ↑ "TRADITI HUMILITATI (On His Program For The Pontificate): Pope Pius VIII". Eternal Word Television Network. Retrieved February 16, 2016. ↑ Papal Profile: Pope Pius VIII The Mad Monarchist. 4 June 2012. Web. 20 February 2016. ↑ Castiglione, Francesco Xaverio. Pope Pius VIII New Advent. Web. Retrieved 16 February 2016. ↑ Miranda, Salvador. Consistories for the creation of Cardinals: 19th Century (1800-1903) The Cardinals of the Holy Roman Church. Web. Retrieved 16 February 2016. Christof Dahm (1994). "Pius VIII". In Bautz, Traugott. Biographisch-Bibliographisches Kirchenlexikon (BBKL) (in German). 7. Herzberg: Bautz. cols. 673–677. ISBN 3-88309-048-4. Wikimedia Commons has media related to Pius VIII. CASTIGLIONI, Francesco Saverio (1761-1830). In: Salvador Miranda: The Cardinals of the Holy Roman Church, online at fiu.edu, Website of Florida International University, retrieved 20 May 2013.